If you ask anyone what they know of Japanese cinema, they might mention Akria Kurosawa or his masterpiece, Seven Samurai. If you come across someone well-versed in the subject, they may bring up Yasujiro Ozu, whose catalog is filled with just as many great films as Kurosawa. You’re less likely to hear mention of Kenji Mizoguchi, a contemporary of Ozu’s who died a couple years after Kurosawa hit it big. About 70 percent of his films have been lost or destroyed, and what remains is scattered between historical epics, simple melodramas, and stories of strong women. 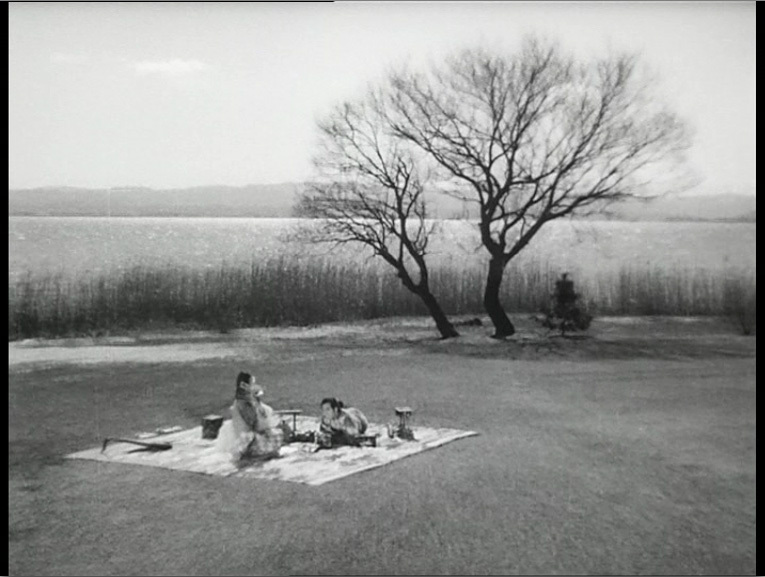 Some are great, some aren’t, but his masterpiece Ugetsu is beyond that distinction. It may very well be the greatest Japanese film ever made. Ugetsu is in an interesting place, genre-wise, caught somewhere amidst the visual tropes of a ghost story, the thematic stylings of a melodrama, and set firmly in a Japanese civil war that took place over 400 years before the film was made. Two men, Gejuro and Tobei, are peasants in this world, and they struggle to survive on what they’ve got. This becomes increasingly difficult when their village is pillaged by one of the sides in the conflict–the peasants don’t care which; they are taken advantage of either way. Genjuro is a potter on the side, and frequently leaves to make some extra money for the family. Tobei and Genjuro decide, now that they are refugees, to take some of their wares to a larger town. It’s farther away from home than they’ve ever gone. They leave their wives behind, promising to return quickly; unfortunately they break that promise and their stay is much longer than they could have anticipated. Tobei and Genjuro each have one unquenchable passion: Tobei wishes to become a samurai, to carry with him the torch of pride and respect, and to protect his wife. Genjuro wishes only to have someone recognize his gift as a potter, also in order to earn respect and pride and to use the proceeds to support his family. In the big city the men’s dreams come true, but at great cost to both of them. Tobei uses some of the money they’ve made to purchase a suit of armor, and the local general gladly accepts him into the army. While he is doing this, a rich aristocrat agrees to purchase all of Genjuro’s pottery, claiming his repuatation precedes him and she has heard great things of him from afar. The camerawork, by the legendary Kazuo Miyagawa (who worked with Kurosawa on Yojimbo and Rashomon) is absolutely sublime – constantly moving and well composed, it is one of the superlative things about this film. The characters are well developed, the writing is suitable, but perhaps the best thing about the film is how it resembles a kind of fable. It treats a subject (morality) using characters that are just this side of archetypes. The film boldly tackles the problem of fuzzy morality. There are choices in our world that lie somewhere between good and bad, and choices that exist outside that spectrum. We try to act as best we can, but sometimes our actions can have unforeseeable consequences. Both of the characters, just like us, experience a kind of fall from grace, only their fall seems like the result of some metaphysical tragedy; they are not the cause of their own undoing. It is a question of “at what cost” we are willing to do something. Is it worth leaving your family–for what you believe will only be a moment–if it is the only chance you have of making your lives better? When put like that, the men’s actions don’t seem so bad. The moral of the story is hard to describe, and is certainly impossible to put into one pithy statement. How do we reconcile the fact that the consequences far outweigh the gravity of a characters’ actions? They have several choices, and in many ways it resembles those loathsome questions on the SAT that have several correct answers. Perhaps the moral is located somewhere in acknowledgement. We hear their story not to learn how to act or how to live. We hear it to further our understandings of ourselves. We are susceptible to failure. We can hypothesize and guesstimate all we want, we can even believe that we have the machinations of the universe figured out. But we need to recognize our ability to fail. In recognizing this, we may not be able to prevent it, but we may be better prepared to deal with it when it comes, and we might gamble a little less when the stakes are so high. As a perfect film, Ugetsu manages to satisfactorily and honestly address a simple moral quandary without falling victim to the demons of sentimentalism and the belief that one possesses the truth. It does not know, and this is part of its great genius, for we don’t either. It simply gives an intensely human tale, wrapped up in misery and woe, failure and loss. And at the end, as with any great work of art, you are left with the halting suspicion that you have gained and lost an infinite thing, one you may never fully comprehend, but are made better by having experienced it. This entry was posted in Filmsmith Faves, Reviews and tagged Japanese Cinema, Ugetus Monogatari. Bookmark the permalink.